Rooted in Sweden, Ampsource has an enviable 30 years of experience designing world class amplification. 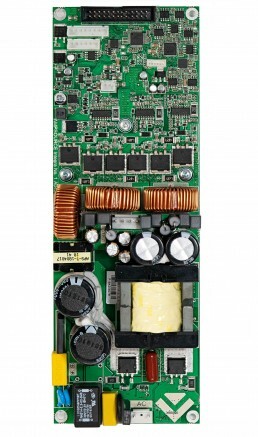 Our engineers have worked tirelessly to bring loudspeaker manufacturers a reliable value-engineered high-power solution in one compact module. Using a combination of superior ingenuity and precision components, Integra No.1 offers a 3 channel power module with smart DSP rolled into one. Finally brawn meets brains. Mount the same module in all speakers to get less stocked variants from less suppliers, while at the same time, gaining greater buying power with higher quantities of a single part. Complete Software Controller Platform serves the need for Live Tuning and Factory Programming. Our superior design and build quality brings you less breakdowns, less support, happier customers and better selling. Full featured DSP toolbox including X-Over and EQs with Butterworth, Bessel and Linkwitz-Riley filters up to 24dB / oct. Delay, Peak and RMS Limiters on each input and output.